Often people desire to divorce with dignity and respect and avoid a contentious battle. Yet the traditional legal process rarely supports this. Collaborative practice is a solution-oriented process for families who want to make decisions about the people and things most important to them, rather than handing their future over to the court. Traditionally, when a couple decides to divorce, each spouse retains a lawyer to advocate for his or her interests and prepare for trial. In reality, though, only 2% of cases go to trial. 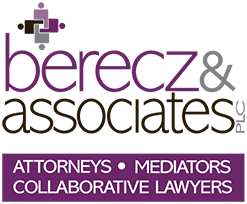 Collaborative practice recognizes there is a 98% chance a case will settle, and gets down to the business of negotiating that settlement. Instead of focusing on getting the largest financial reward no matter what the human or financial cost, the parties and their counsel work toward “win-win” solutions to meet the needs of both spouses and the family as a whole. Each collaborative attorney has primary allegiance and duty to his or her own client, but recognizes that serving the highest interests of the client includes acting with integrity, respect, and in the spirit of cooperation. It begins when both parties hire lawyers trained in collaborative practice. An agreement is signed by both spouses, and by both lawyers, committing all to settling issues in a non-adversarial manner, without going to court. Everyone agrees to work together respectfully, honestly, and in good faith through a series of meetings between husband, wife, and their collaborative team. No one may go to court, or even threaten to do so, as long as they are in the collaborative process. Meetings are held until all issues have been discussed and agreement reached. Your divorce coach is a vital member of your collaborative team. When a marriage ends, there is a legal and an emotional divorce. Your divorce coach is a mental health professional who ensures emotions are productively processed and helps you avoid getting stuck in pain and anger which can naturally arise. The coach also helps you replace unproductive communications patterns with new ways to communicate to better reach agreements and prepare you to co-parent in the future. Another benefit of collaborative practice is the ability to seek assistance from other professionals trained to address different challenges. This can include a financial specialist to assist with understanding cash flow and assets or a neutral child specialist who assists parents in developing child-centered parenting plans and understanding the child’s own divorce adjustment issues. What emerges is a more thoughtful, well-designed plan to meet your child’s needs. In the unlikely event that you or your spouse feels going to court is a better alternative, the participation agreement all participants signed in the beginning states the collaborative process ends and both spouses must hire new lawyers to take their case to court. Fortunately, this rarely occurs. Limiting the terms of representation keeps focus sharp throughout the process and maintains clarity about the intent of collaborative practice. After settlement is reached, a Judgment of Divorce is drafted with the details of your agreement. Both spouses and lawyers sign the agreement and a very brief hearing is scheduled to submit the judgment to the court for the judge to sign. Only the spouse who filed for divorce and his or her lawyer need attend. More information is available at the International Association of Collaborative Professionals website at www.collaborativepractice.com. For a list of collaborative practitioners in the Grand Rapids area, visit www.gentlerdivorce.com. In Southwest Michigan, visit www.michianacollaborativedivorce.com. To learn more about collaborative practice and how it might work for you, contact us at 269.428.3447 in St. Joseph or 616.466.4131 in Grand Rapids or email us at [email protected].